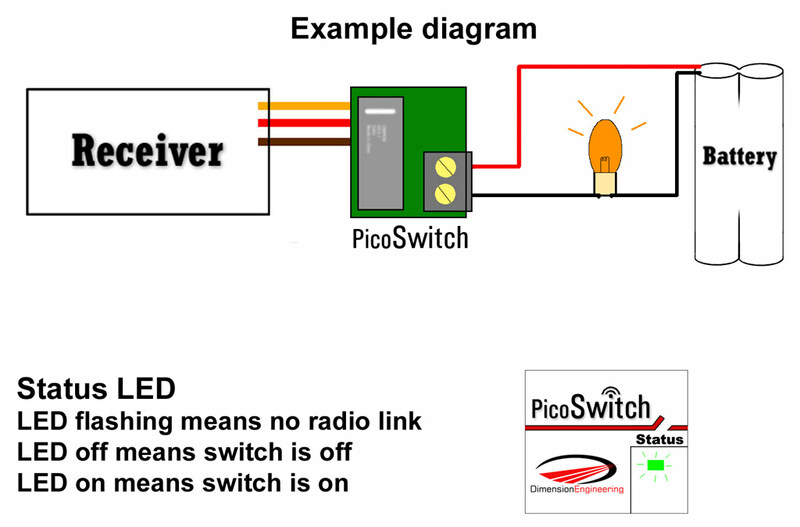 PicoSwitch is a relay switch that you toggle via hobby radio control gear. You can use PicoSwitch to quickly and easily control anything from a digital camera shutter to an electric squirt gun to home lighting and more. You can activate applications with voltage levels as high as 125VAC without having to know anything about microcontroller logic levels or transistors because the relay offers full electrical isolation from your receiver electronics. PicoSwitch plugs into a standard hobby radio control receiver as easily as a servo does. You connect the load that you want to toggle using PicoSwitch's wear resistant screw terminals. Depending on the channel you use, you will then be able to control the relay by moving your radio's control stick up or down, left or right, or another method you desire. Picoswitch has a status LED on the bottom. The LED will light up when the relay switch is on, and vice versa. It will also tell you if your radio link is too weak by flashing repeatedly. The relay is a single pole single throw switch. Its typical lifetime is 100,000 to 1,000,000 switching cycles, depending on how heavy a load you are using. The relay is normally open when unpowered. PicoSwitch does not supply power at the screw terminals. PicoSwitch should not be used to switch inductive loads like motors or solenoids without an antiparallel diode. Need more power? Try BattleSwitch. Size: 0.75" x 0.62" x 0.62"
Control of lighting systems on RC planes, boats, cars. Note: PicoSwitch has a maximum voltage rating of 125VAC, making it unsuitable for toggling 220VAC applications.